Tomorrow there will be a public workshop for San Jose's Better Bike Plan 2025 project. Many more bike sharing stations are coming to San Jose, and this is a great opportunity to provide your input on a plan that will make biking "safer, easier, more convenient, and more comfortable to everyone." 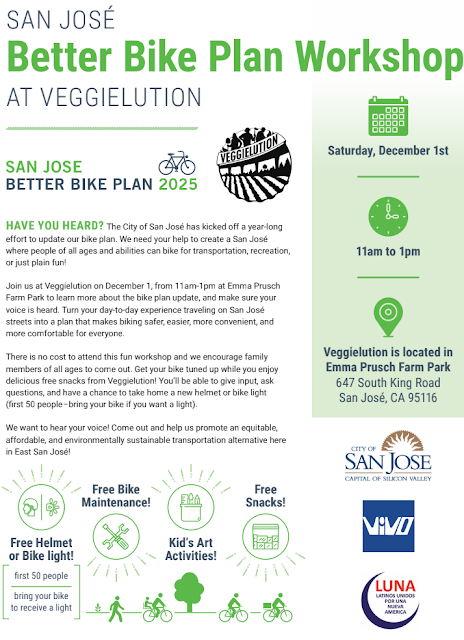 The workshop takes placer from 11am to 1pm, December 1st (tomorrow), at Veggielution in Emma Prusch Farm Park (647 South King Road, San Jose).